* First whiff is a sweet, boozy leather. * What is the toilet paper called – that is soft yet strong? That’s how this starts off. * Some sweet tobacco joins the mix. * It is not smoky at all – if you want a smoky scent try Naomi Goodsir’s other scent Bois D’ascese. * The tobacco is joined by a light maple syrup note. This is probably the immortelle coming through – as immortelle smells like that on my skin. * The base is a sweet, but not too sweet, amber-y incense. 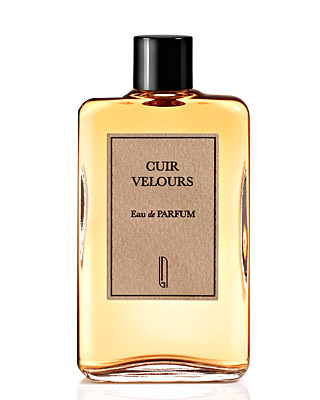 Summary – I discovered Cuir Velours at Corsi Cuomo in Milan. After spraying it on my wrist, it was love at first smell. I let it develop for a few hours and bought it the same day. The bottle has become my everyday, no-brainer favorte. It is easy to wear and smells great, yet is interesting enough to enjoy throughout the day. Longevity is great- lasting more than twelve hours. It is also office-friendly after the first thirty minutes or so (initial projection is quite strong). I really love this fragrance and have already gone through a third of the bottle in three months (and considering my perfume closet, that is saying a lot). It is also one of those scents that make me feel happy to wear – not just because of the pleasant associations to a great vacation – but because it is uplifting and energetic (wow, that sounds like a motivational speaker) but not obnoxious or too aggressive. I strongly recommend that everyone test this scent. Noami Goodsir fragrances are available at Luckyscent and Min NY. Disclaimer: No disclaimer needed as I own a full bottle. Picture courtesy of LuckyScent.